This week Korea’s Hyundai Motor Company unveiled its first SUV Powered by Hydrogen (H2) Tucson Fuel Cell Electric Vehicle “FCVE” for North America. We have details! The Powered by Hydrogen 2015 Hyundai Tucson Fuel Cell Debuts at the Los Angeles Auto Show – The Tucson Fuel Cell is already catching the interest of auto show attendees, especially those who average over 100 miles a day to over 700 miles a week commuting between San Diego County, Riverside County, Orange County, Kern County and Los Angeles County. The announcement of an upcoming hydrogen-powered 2015 Tucson Hydrogen Fuel Cell SUV, positions the Korean automaker as the first to offer a mass-produced fuel cell vehicle in the US (Toyota and Honda are both developing their own Fuel Cell EV models and are currently showcasing Fuel Cell technologies at the shows as part of their Concept Cars). The Hyundai Tucson is the next-generation of fuel cell electric vehicle (FCEV) technology, using fuel-cell power from compressed hydrogen (H2) to generate electricity and power an electric motor. 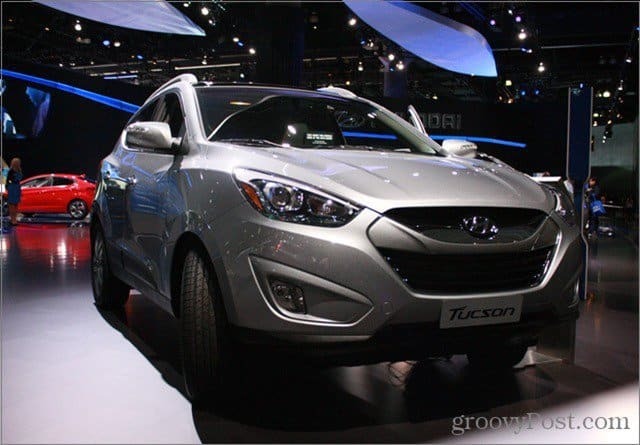 This years International Auto Show in Los Angeles debuted many new designs and Southern Californian residents will be excited to hear that Hyundai’s hydrogen-powered 2015 Tucson SUV is coming to Southern California next spring, to both Los Angeles and Orange Counties. And, if you want to be one of the first to have an extended test drive, you will soon have the opportunity to rent a Hyundai fuel cell Tucson SUV at participating Enterprise locations around southern California. The 2015 Tucson FCEV is based on the Hyundai ix35 Fuel Cell, which launched in the European markets earlier this year. California also plans to continue expanding the availability of H2 to the residents, with at least 100 H2 fueling sites planned statewide. Key features include refueling in under 10 minutes with a 240V charge, and greater range of *up to 300 miles. These stats are a very impressive when compared to all the other Electric Vehicles (EV) on the road today requiring at least 3 hours* with a 240V charge, or a minimum of 14 hours* with a 110V charge and a range under 150 miles. Hyundai’s hydrogen powered 2015 Tucson Fuel Cell delivers a similar driving range as a gasoline powered vehicle but with zero tail pipe emissions, the only by-product is vapor (heat and water created by the engine). And, the 2015 Tucson Fuel Cell is capable of starting and operating at sub-zero temperatures. Finally, affordable cars that run on water (H2) are arriving in the USA – Starting with $2,999 down, you will be able to lease the Powered by hydrogen 2015 Tucson Fuel Cell for $499 a month for 36 months, and that includes “unlimited free hydrogen refueling” and a hydrogen version of the “At Your Service Valet Maintenance.” included in the price of the lease. The information sheet that was provided has no details about buying one of these SUVs outright unfortunately. 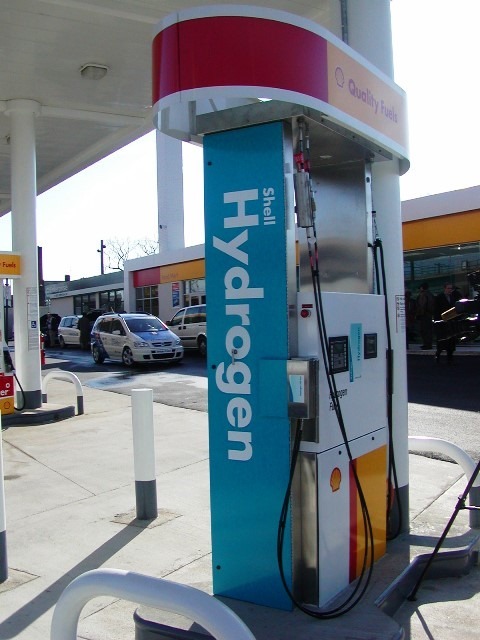 Currently, there are only ten public hydrogen refueling stations in the US, and nine of them are in California, guaranteeing that the Tucson will be available only in the Golden State — specifically at just four dealerships. Hyundai said in a statement that, “Availability of the Tucson Fuel Cell will expand to other regions of the country consistent with the accelerating deployment of hydrogen refueling stations”. In other words, the technology is once again ahead of the infrastructure that lies beyond the largest cities in North America. Fuel cell technology is an ideal solution in many ways. 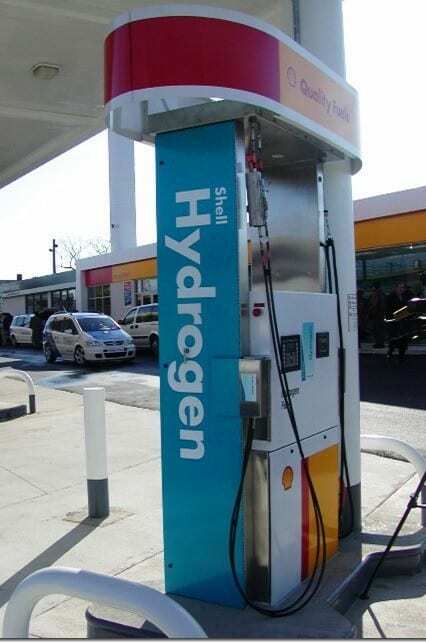 Zero use of gasoline and it emits only water vapor, heat (which powers the car) and trace amounts of hydrogen. In other words, no harmful emissions whatsoever. 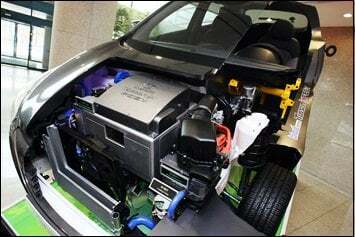 Hyundai introduced the i-Blue concept car at the 2008 Chicago auto show, showcasing a third-generation fuel cell engine and the first-ever Hyundai built from scratch around the fuel cell itself. The i-Blue is capable of running more than 370 miles before refueling and can achieve a top speed of more than 100 miles per hour. Speaking at the unveiling, Hyundai Motor America CEO John Krafcik praised the hydrogen work that Honda and Toyota are doing here at the 2013 Los Angeles Auto Show and said, “We think fuel cell technology will increase the adoption rate of zero-emission vehicles, and we’ll all share the environmental benefits.” The 2015 Tucson FCEV sets a new Electric Vehicle milestone for a production EV-SUV with an estimated 300-mile range and a refill time of under 10 minutes along with the instant torque of an electric motor. The Groovy Green Auto Enthusiasts around the country will be intensely curious to see what FCEV models are announced next from Honda, Toyota and for the US marketplace. Really excited to see so many new options for clean energy, taking things to the next level. Will have to see which tech goes the way of the BetaMax / HD DVD. Honestly, I personally don’t care as long as it takes us away from oil…. We also learned a little more about Hyundai Assurance – includes a Lifetime Battery Replacement Guarantee. Currently the most comprehensive warranty programs offered in the US for Electric Vehicles (EV). This cleary sets Hyundai apart from Toyota and Honda. Lifetime Batter swap — wow, that really lowers the risk factor. Great tip Leah.